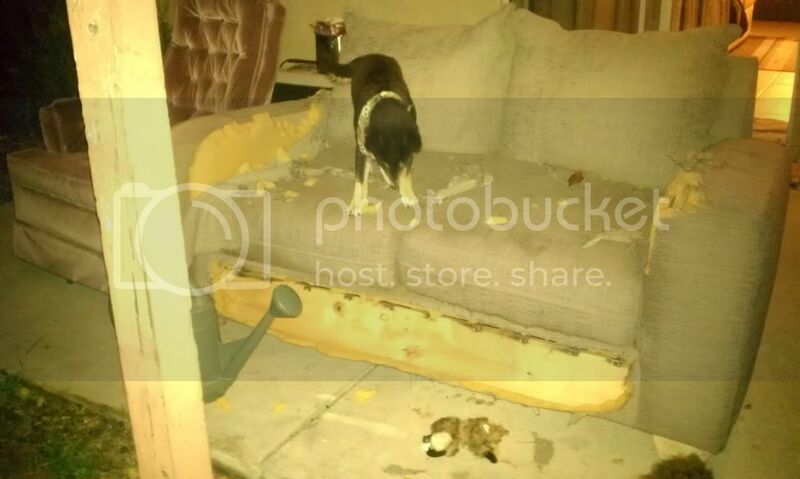 When does the furniture chewing Start? She's only 10 weeks old...you got to wait for her to age a bit then the damage will start. Usual time for furniture chewing is when they start teething...I forget...but I think thats around 4 months of age? As long as you give her enough chew toys, redirect her chewing to them, and tire her out...you should be fine. Yes, Yuki started chewing on furniture, house fixtures, remotes, phones, etc around 4 months and at 13 months she is still going :/ But my mom's shiba doesn't seem to care to chew on much-I think he tried the stairs a couple of times but never really amounted to much damage and he is around 6-7 months now. We've never had a problem with Kari (now 7 months old) chewing on furniture. She has chewed on a fan cord and broke through the covering and into the wiring. Lucky the fan wasn't plugged in. But since then, she's learned to only chew on toys and ropes that we give her. Keiko started tasting the rungs of my chair at around 8-9 weeks, has tried the lower shelf of an end table and the lower shelf of the coffee table (or the table that serves as one), but hasn't done any damage yet. She's much more attracted to cardboard boxes and the small rugs in the living room. I happen to have some bitter apple spray which is old and really concentrated--great stuff. Juni only ever tried to chew the baseboards, which immediately stopped when we applied chili paste on them. But she's a weird little dog, she doesn't like chewing much, especially not on hard objects. So chew treats must all be small and thin and preferably wrapped with jerky or something for instant gratification. Sagan has never attempted to chew on furniture and he's a little over 4-months-old now. He has chewed on a laptop cord that was actually plugged in. He's never chewed a cord since then, but my partner thinks he got shocked a little, due to why he doesn't attempt to go for them anymore. I just think we do a lot of redirection that he finally correlated that toy = good in my opinion. 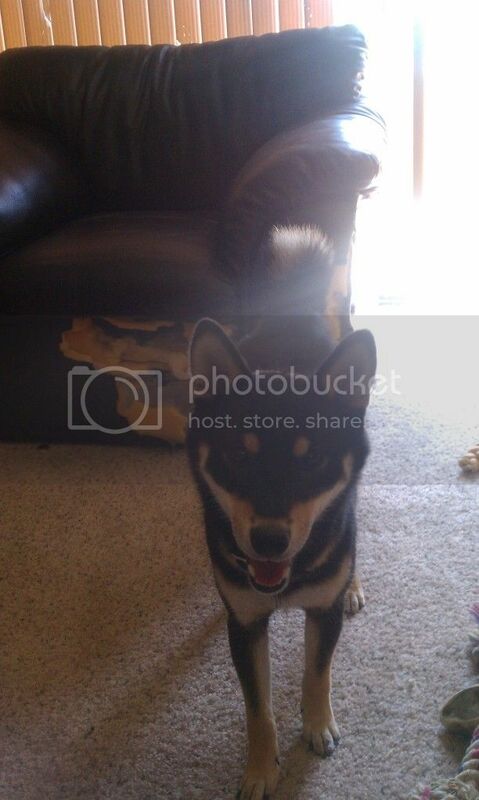 My Shiba didn't really try to chew on the furniture much. I learned from my previous dogs how to stop that, and any unwanted chewing. 1. Never allow the pup out unsupervised. 2. Anytime the pup chews or mouths something I don't want them to, I told him in a firm but nice tone "No" then redirected him onto a chewtoy or treat. My Shiba learned really fast what he was and wasn't allowed to chew on, and thankfully (with the exception of writing utensils) that stuck into adulthood. Other than stuff we have given our dog, he has only chewed one shoelace and the corner of a baseboard. He's now almost two years old and the baseboard incident happened around 4 months old - so it's been a while since that happened... Yes, I am knocking on wood as I type this! It never starts. I watched Kyoto like a hawk for the first few weeks to make sure he never put his mouth on anything he wasn't supposed to. A stern "HEY!" is usually enough to startle him in the act ("HEY" is another word for "NO" in our house), but he never put his mouth on the couch or tables; caught him once trying to gnaw on a chair, but the "HEY" is all I needed to stop it once and for all. Other than that, get some toys and more toys; he'll eventually learn what he can and cannot chew without much effort from you. ^^^ holy crap... If that were my furniture the expen would have a lid on it! Oh my gosh, I think you should rename him Nashers :-O! Ok, now I'm starting to panic a little! Just a little update. Kasha is now over 6 months and still no chewing. I'm wondering if I'm in the safe zone yet? She still likes to chew her toys, rawhide and my fingers. I'm considering not crating her during the day while I'm at work. What do you guys think? Is this a wise move or should I wait a little longer? When you think it's safe..it isn't. I left my dog out while I was at work once and she chewed a hole in the wall (bye bye puppy deposit). Granted I was gone longer than normal, but the moral is anything can happen. Mine is eight months old and has never chewed anything she wasn't supposed to. It's tempting to leave her out in just my bedroom while I'm at work now, but at the end of the day there's no way I trust her. Like @Slagemann13 said, just when you think it's fine, it won't be. I'd suggest waiting some more if she's only six months. 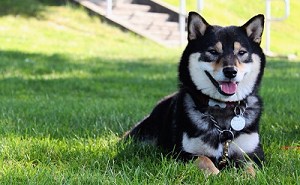 @Zaza your shiba is not chewing because you: 1. Are with her when she has free roam. So she knows she's being watched. 2. Are crating her when you're at work. The fact that you posted and asked if you should give her free roam hints that you are doubting whether or not you can trust her. I would just wait until she gets older. 1-2 years at the least. My own opinion: if a dog likes their crate and is fine in there, why stop crating, thus exposing yourself to worry and your dog to potential harm? If I could crate my dog, I would. It would save me the stress of wondering if my dog is okay and it would have saved the carpet in my bedroom too. Kaji chewed the edge of my coffee table when he was about 5 months old bc my dad was watching him for the week. His teething was about 4-5 months, which is when he was searching for things to chew. He hasn't had any furniture snacks since them, but I did spray them all with something to keep him for tasting them. I also keep an eye on him and for unusual noises. He knows when he's doing something wrong. As far as crating him during the day, why not? At least you know he cannot do anything wrong. Kaji is 7 months old now and I only leave him unattended when I take my son to school. I am home within 20 minutes or so. I don't want to leave him all day without supervision bc he tends to get carried away when he's having fun. I think once Kaji is about 1 1/2 years old, I might give him more freedom. But right now, it is for his safety as well as my sound frame of mind. This has yet to happen with my guy. He only chews on his own stuff. It's not a result of any training or anything, which I'm horrible at. Just over two years and our dog has chewed the corner of one baseboard thus far. I think this was when he was teething as well. @Bootz - She has free roam of the whole house when I'm home, she isn't a fan of the kitchen for some reason so when me and my partner are cooking or cleaning she is usually playing with her toys in the other room or laying on our bed. I do crate her while I'm at work usually 4 to 5 hours Monday to Friday but I really get the impression she doesn't like it. Before I go to work in the morning I give her chicken and cheese in the crate and she will walk in to it with her head down and looks quite sad to be honest. At bedtime she will growl at me slightly if I go to take her to bed, she knows when I say bed it means crate, lol! I always treat her and praise her when she goes in. She will never use the crate as somewhere just to go for a sleep. She also has chew toys in with her but I find she never seems to bother with them. I give her a stuffed kong in the mornings also but she doesn't touch it in the crate, she keeps it for when she gets out in the afternoon. I do not want to give her total freedom just yet as I'm not sure if she is totally trustworthy plus she still chases the cats. @Zaza, which do you value more? Her safety or her happiness? My Shiba Bootz is very sneaky. She is VERY obedient when i'm home. But throws tantrums when i'm gone cause she's upset with me. She is a typical shiba, very clever. I actually gave her free roam (after crate training her) because her younger sister jackie (shih tzu mix) got free roam and I thought it was unfair. I came back to a mess all the time. But a mess of things that were safe like...a tissue box or water bottle i left by my bed...all of which was torn up when I got home. This is when she was 6 months. To be honest, I SHOULD have waited. BUT @ 1.5 years old, Bootz has matured, and learned that she should not take her freedom for granted. I bought a Cam to keep an eye on them. All she does is sleep with her sister. Every 30 mins she will have a Hachi moment and stand by the doorway waiting for me to come home. But her destructive behavior definitely went away with age. There are a lot of people that actually give their young shibas free roam and they ended up tearing up the place.....chewing on the trims...the drywall...ruining the carpet. Are you ready to cover those expenses if it happens? I'm not sure if you're in a rental or own the house but you will have to keep that in mind when deciding whether or not to give your Shiba free roam ALONG with their safety in mind. For us it started at 6.5 months. She's only gotten the handle to the lazy boy chair and I think that's when left alone when the 20 year old is home with her. I have found she has a new habit of scratching at the leather couch. I think she thinks there is a ball under there....."Zooey there is nothing there. LEAVE IT!". Yes, based on what's said above, Tatonka is always at daycare during the day. At night when i leave to go out I crate him. Though he's not destructive (I've run a lot of trials with cameras running for hours), I crate him for volume reasons. Yes he's a smart Shiba and knows exactly which corners of my apartment amplify his cries the most and concentrates there (no joke). I have a 9month old who was always kind of a chewer since we got her at 12 weeks...with bully sticks, Himalayan chews etc. But now those don't last long. She obliterates her toys in a matter of hours, if that. Stuffing everywhere, every day until she removes the squeaker so no more stuffed toys. She likes her Benebone and that keeps her busy for a lil bit. It seems like she chews from the moment she wakes up until bed time. She gets a firm no and redirected when it is something she shouldn't be chewing and she is crated when we are not home. My now problem is, she usually sleeps in the bed with me with no issue, but for the past few nights, at 3am I found her chewing on my bedroom carpet. For those of you that had heavy chewers, does it ever get better? Do they grow out of it? 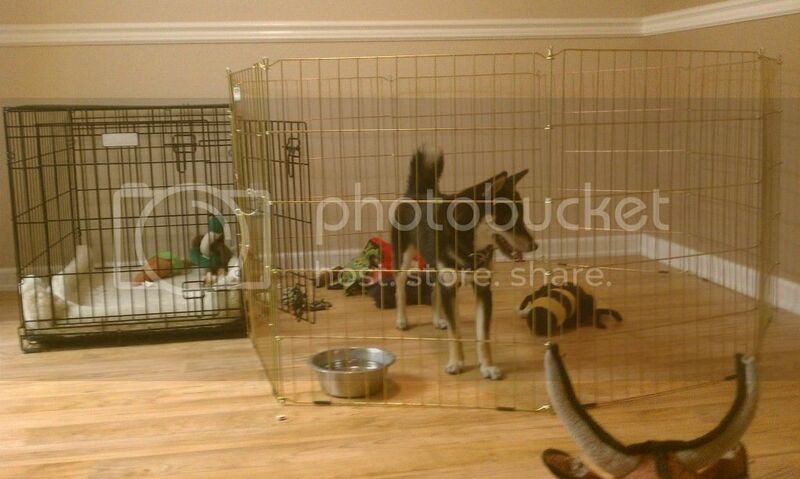 I would hate to have to crate her again at night.